1. Combine oats and milk in a bowl, set aside. In a large bowl, mix flour, sugar, baking powder, salt, cinnamon and nutmeg. 2. To the oat mixture add melted butter or margarine, eggs, vanilla extract and mashed potatoes. Stir well until mixed. 3. Add the wet ingredients to the dry and mix until just combined. 4. 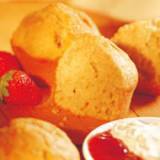 Fill greased muffin pans to 3/4 full and bake in a preheated 375°F (190°C) oven for 20 minutes.